$2,990.00 Group of 6 decorations and 7award documents to a Police Lieut. General, Minister of Interior of the Soviet Republic of Georgia. Among the awards are WW2 Order of the Red Star, two post-war civilian orders, and documented medals for the Defense of Moscow, Protecting the Public Order, and Guarding the USSR State Border (Var. 1 in silver.) The group also includes a documented Police 60th Anniversary table medal in original folio case. The recipient served as a high-ranking KGB operative before becoming Minister of MVD of Georgian SSR from 1972-79. The person he succeeded on that post was none other than Eduard Shevardnadze - the future Soviet foreign minister under Gorbachev and later, president of the newly independent Republic of Georgia. An extremely uncommon group to a very important Soviet official. $390.00 Medal for Distinguished Service in Guarding USSR State Border, Var. 1 in solid silver, mid 1950s - early 1960s issue. Sub-variation with rounded eyelet. In excellent condition. 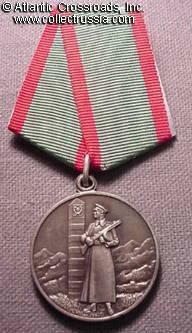 $170.00 Medal for Distinguished Service in Guarding USSR State Border, Var. 2, circa 1960s-70s. Extremely attractive piece in near mint condition, showing dark patina and with perfect old ribbon. This example is practically impossible to upgrade. $290.00 Medal for Distinguished Service in Guarding the State Border, post-Soviet issue, 1992-94. Near mint condition. $290.00 Document for Border Guard Medal, a highly unusual 1963 issue to a woman. Hand-signed by KGB General Zakharov, Deputy Chairman of the USSR State Security. In excellent condition. $245.00 Document for Border Guard Medal, 1954. A very early certificate issued with the Variation 1 medal (in silver). Features 16 republics in the state emblem and hand-signed by Deputy Minister of MVD, Lt. General Perevertkin. Excellent condition. $95.00 Medal for Distinguished Service in Protecting the Public Order, Var 3, 1970s-80s. Excellent condition. $195.00 Document for Medal for Protecting the Public Order, awarded in December 1972 by the Supreme Soviet of Ukraine. In excellent condition. $95.00 Medal for Irreproachable Service in KGB, 1st cl. (for 20 years of service), Type 1 in solid silver and enamel, circa late 1950s - early 1960s issue. In excellent condition. $40.00 Medal for Irreproachable Service in KGB, 1st cl (for 20 years of service), 1960s- 1991. This type of medals with Roman numerals on the obverse were awarded exclusively to KGB officers. Excellent condition. $25.00 Medal for Irreproachable Service in KGB, 2nd class (for 15 years of service). Excellent condition. $30.00 Medal for Irreproachable Service in KGB, 3rd class (for 10 years of service). Near mint condition. $20.00 Medal for Irreproachable Service in MVD, 1st cl. (for 20 Years of service). In solid silver and enamel. In excellent condition. $9.00 Medal for Irreproachable Service in MVD, 2nd cl. (15 Years). Excellent condition. $10.00 Medal for Irreproachable Service in MVD, 3rd cl. (10 Years). In excellent condition. $30.00 Medal for Irreproachable Service in MVD of RSFSR (Russian Federation), 1st cl. 1960-62 issue. Awarded for 20 years of uninterrupted service in Police or MVD Internal Army. This particular medal was issued only briefly, during a two year period when each republic had its own Ministry of Internal Affairs. $45.00 Medal for Irreproachable Service in MVD of RSFSR (Russian Federation), 2nd cl. for 15 Years of service, 1960-1962 issue. Excellent condition. $50.00 Medal for Irreproachable Service in MVD of RSFSR (Russian Federation), 3rd cl. for 10 Years of service, 1960-1962 issue. In very fine to excellent condition. $35.00 Medal for Irreproachable Service in MOOP of RSFSR (Russian Federation), 1st cl. (for 20 Years or service), 1962-68. Excellent condition. $40.00 Medal for Irreproachable Service in MOOP of Ukraine, 1st cl. (20 Years), 1962-68. Excellent condition. $175.00 Medal for Irreproachable Service in MOOP of Azerbaijan, 2nd class (for 15 years of service), 1962-68. $190.00 Medal for Irreproachable Service in MOOP of Belorussia, 1st cl. (20 years), 1962-68. In excellent condition. This is one of the harder to find medals in the "republican" MOOP series. $120.00 Medal for Irreproachable Service in MOOP of Georgia, 1st cl. (20 years), 1962-68. In excellent condition. $150.00 Medal for Irreproachable Service in MOOP of Georgia, 3rd cl. (10 Years), 1962-68. Very fine to excellent condition. $190.00 Medal for Irreproachable Service in MOOP of Moldavia, 1st cl. (for 20 years of service), 1962-68. Very fine to excellent condition. $160.00 Medal for Irreproachable Service in MOOP of Uzbekistan, 1st cl. (20 Years), 1962-68. In excellent condition. $12.00 Medal for Irreproachable Service in Fire Department, 1st cl. (for 20 Years of Service). Excellent condition. $9.00 Medal for Irreproachable Service in Fire Department, 2nd cl. (for 15 Years of Service). In excellent condition. $8.00 Medal for Irreproachable Service in Fire Department, 3rd cl (10 Years). Excellent condition. $35.00 Document for a Medal for Irreproachable Service in Fire Department, 3rd cl., October 1990 issue to a Firefighter Sergeant Major. A very uncommon late type white booklet with USSR state emblem on the cover. This is one of the last such documents issued before the collapse of the USSR in the following year.